With silks in neutral and small dashes of colour, linen in crisp white, suedes and woollen carpets in light cream and woods in honey or mahogany brown, rooms are finished in a palette of neutral hues, creating a soothing ambience. Each offers air-conditioning, flat-screen satellite television, a DVD player and wireless ADSL connection. All have spacious en-suite bathrooms. Five are complete with bath, glass shower, heated towel rails and windows for sunlight,whilst the sixth has a sauna instead of a bath; they are spaces that demand pampered rejuvenation. Sea facing opening onto timber deck. Bedroom has a queen bed, decorated with neutral silks, woolen carpets, small dashes of colour and mahogany and honey coloured wood. En-suite bathroom with bath and shower. Limited sea facing opening onto timber deck. Bedroom has a queen bed, decorated with neutral silks, woolen carpets, small dashes of colour and mahogany and honey coloured wood. En-suite bathroom with bath and shower. 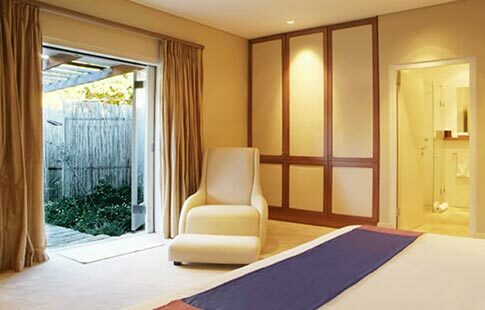 Bedroom with big sliding window. Decorated with neutral silks, woolen carpets, small dashes of colour and honey coloured wood. En-suite bathroom with bath and shower. 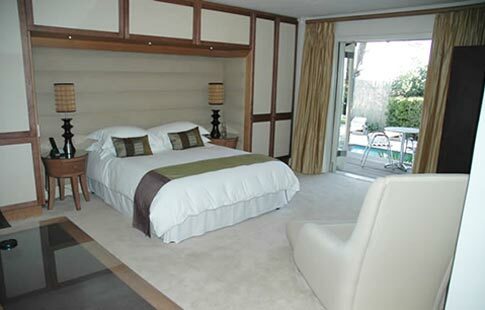 Private room has beautiful view of Table Mountain with own small garden and alfresco shower. 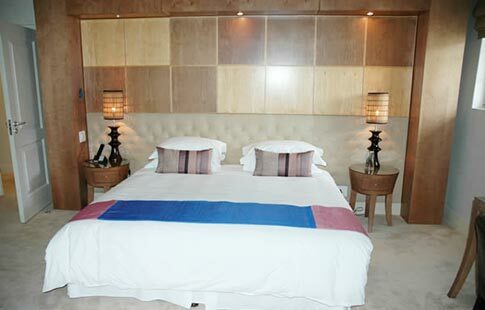 King or twin beds decorated with neutral silks, woolen carpets, small dashes of colour and honey coloured wood. En-suite bathroom with bar and shower. Pool facing room overlooking the garden, opening onto timber deck. 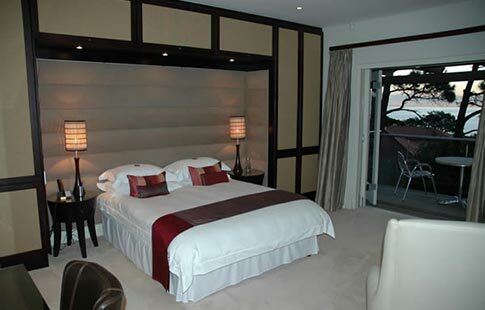 Queen bed decorated with neutral silks, woolen carpets, small dashes of colour, mahogany and honey coloured wood. En-suite bathroom with bath and shower. 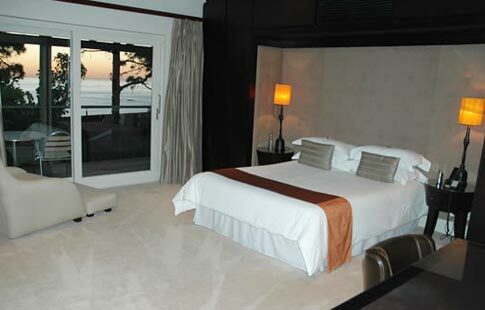 A view of Camps Bay and the Atlantic Ocean greets you as you enter the open area of the lobby,living room and bar. The ambience is one of quiet elegance and tranquility The central designer lounge opens with expanding doors onto a wonderful deck complete with loungers- the perfect spot to unwind with afternoon tea or a sunset cocktail during summer. In winter an oversized fireplace invites cosy evenings indoors The pool is the central focus of the garden where chaise lounges invite sunbathing and relaxation. On request, Atlantic House can arrange for indulgent spa treatments in- house In the lounge, the atmosphere is one of intimacy, relaxation and privacy. The chic décor ensures a lifestyle of sophisticated simplicity; whilst the custom made furnishings in dark woods, silks, leather and natural lighting create a lovely sense of deep comfort, With a lovely big fireplace and lots of books and magazines to peruse the temptation is just to put one’s feet up for cozy evenings. There is also free wireless internet. Unwind in Atlantic House’s lush and secluded environment.